Thanks for Another Wonderful Run! When do hilarity, torture, and enlightenment go together? When comic actor and award-winning playwright Donna Rae Davidson attends a ten-day silent meditation retreat (Vipassana), that’s exactly what happens! The result is 10 Days to Happiness, a zany, introspective comedy about discovering peace in the midst of internal conflict and angst. 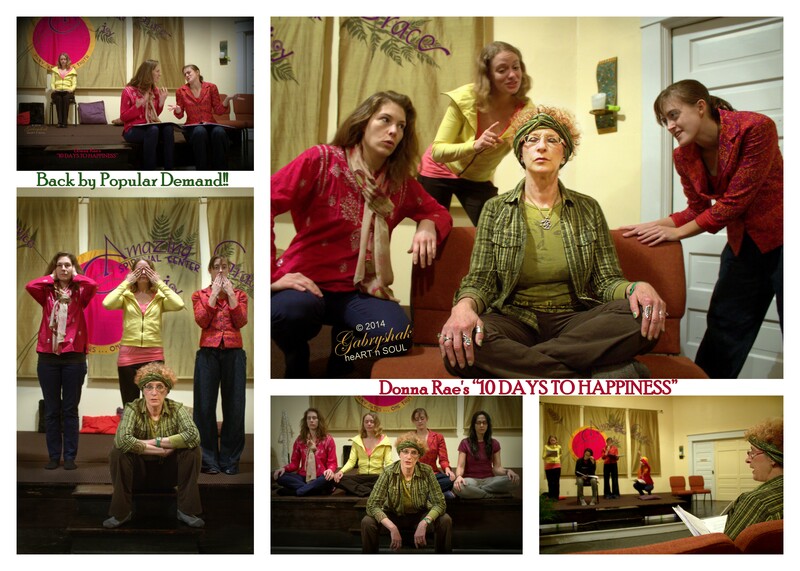 10 Days to Happiness is a one-woman play based on Davidson’s experience at Vipassana. Davidson takes the audience on her extremely personal adventure of no talking, no reading, no writing, and no eye contact. A full-length play in ten scenes, each of the ten scenes represents a day at the retreat. 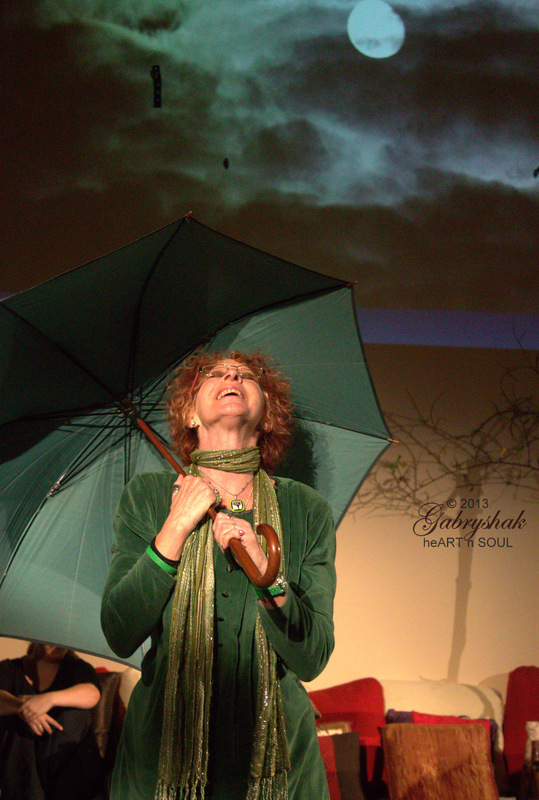 No doubt the first and only play about a silent mediation retreat, Donna Rae is supported by a laugh-out-loud slideshow and 3 silent assistants who meditate, eat, and walk the walking path with her. Veteran actor and director Therese Diekhans directed 10 Days to Happiness‘s October 2013 debut. Packed with memorable wit, quips, wackiness and wisdom, the audience will participate in unexpected ways and enjoy an experience that goes beyond mere entertainment. 10 Days to Happiness is BACK by POPULAR DEMAND, and it’s even happier than before! The play will feature a new cast and special music and chants written by Donna Rae Davidson and her award-winning collaborator Rob Jones, and recorded by the Spirit of the Sound Choir. 10 Days to Happiness will be performed at Amazing Grace Spiritual Center in Ballard, 2007 NW 61st Street, Seattle, WA, Fridays and Saturdays from Feb. 21 through March 15, with 2 matinees on the last 2 Saturdays and a special opening night Gala fundraiser Thursday, Feb 20th. Tickets are available at Brown Paper Tickets. Tickets are $15 in advance, $20 at the door, with special $35 pricing for the Thursday opening performance. Will you ever present this play again? I have commitments all of my October weekends. Kelly, you’ll be glad to hear an even happier new 10 Days to Happiness will open Feb 20th and play through March 15! Great show! Why not give credit to the talented supporting actresses and technicians here on the website? They are all phenomenal! Donna Rae ~ We are holding a vision of seeing you in NY and every major city you’d like to play in ….performing this play, and your other new shows, night after night after night…..get ready girl for more OPENINGS ! !